Two weeks ago, Tom, Molly and I took a very quick trip to Montemboeuf to see how things were going with the build. Having not seen the house since Easter, I was expecting quite a few changes, and there certainly were. The biggest change is of course our wall. It completely changes the look of the house and it was so good to see Stuart’s handy work in the flesh. I could see why he was so proud of it. He is clearly a very talented mason. 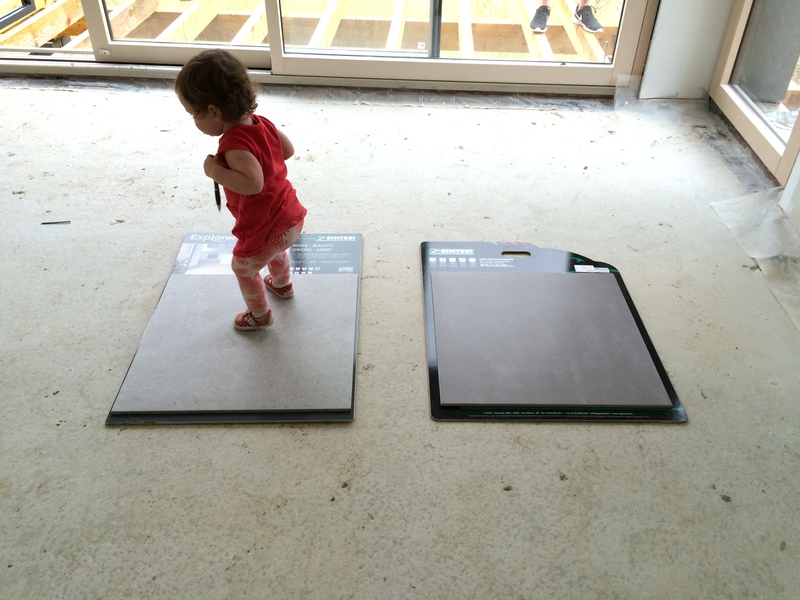 Unfortunately, while we were there we discovered that after all the time and effort we took choosing tiles, we found out that our floor tiles were no longer being made and so we had to chose from a new set. We narrowed it down to two, and Molly and Stuart had the deciding votes because Tom and I preferred different ones. Stuart didn’t waste anytime in starting the work on the screed and the tiling. Partly because, we couldn’t do anything else in the house before this was done! The downstairs tiling in practically finished already, which means Bernard and Thromas (our electricians and plumbers) can start with the second fix! With any luck, the tiling will be finished by the end of next week. If all goes to plan, Tom may actually have a working kitchen and bathroom when he goes back in July. Stuart also started work on the terrace. it is apparently in the mid 30 degrees at the moment, very hot weather to be working outdoors. Still better that than on the roof! On a slightly more annoying note, our doors are still not fixed. Doors and big windows always seem to be a moment of high tension in Grand Designs, and it is with us. They went in easily enough, but now they don’t really work. The manufacturers have been out a couple of times to try to fix the problem, but haven’t resolved it yet. I just hope when they do come again, they fix them and don’t damage the tiling. Categories: French House Build, Montemboeuf Plot, SLM Construction, Terracing, Tiling | Tags: Landscaping, Montemboeuf weather, SLM construction, Terracing, Tiling | Permalink. Although I have been quiet on the blogging front recently, things in Montemboeuf have been moving forward at a pace. Unfortunately, plaster boarding, and taping and jointing are not the most exciting things to be writing about or to show in images. They may be an important part of the whole build process, but they don’t get the proverbial juices flowing! 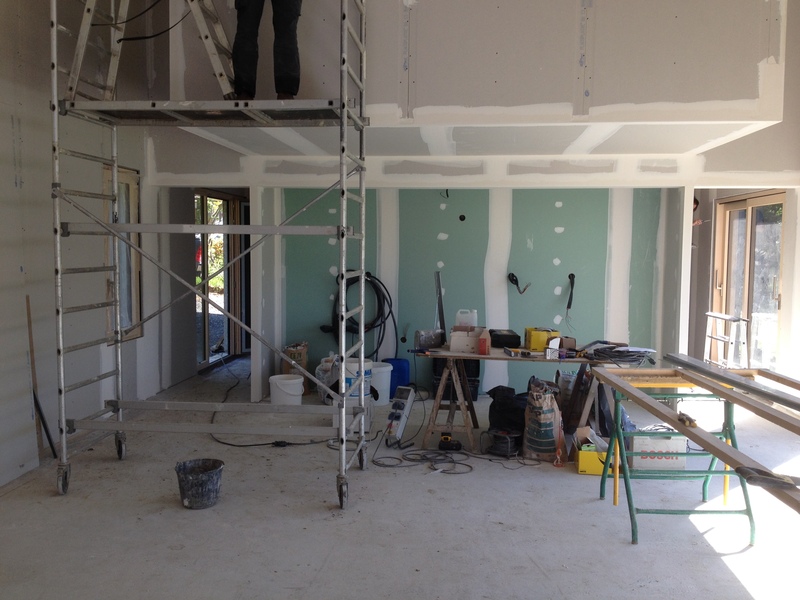 There is quite a lot of house to plaster board so it is not surprising that it has taken a while. We hope that the plaster boarding will be finished by the end of the month and then work can start on the painting and tiling. This has meant that we have been trying to chose colours for the house. Fortunately, a lot of the house will be painted grey or white, but with a few splashes of colour. We have a rough idea of the colours we would like, but when it comes to tones – there is a lot to chose from. We have also been warned that French paint is not as good as English paint, so we’ve been going through swatches from Dulux, Little Green and a few others. There really are 50 Shades of Grey! Grey may sound dull to some people, but if used well and with the correct contrasting colours, it can be very effective. Tom is also planning to contact our kitchen supplier to arrange for them to come out in July. Hopefully, they can install it in time for our visit in August/September. In the meantime, Tom and I will be not only be choosing paint, but also furniture and kitchen equipment. Our first guests (my sister and her family) are booked in for late August, we need to be ready for then. Hopefully, there isn’t a classic ‘Grand Designs’ moment coming up! Still at least there is a nice Chambre d’Hotes in Montemboeuf if things are not ready! Categories: First fix electrics, First fix plumbing, Interiors, Landscaping, Marandat | Tags: plasterboarding, Terracing, Wall cladding | Permalink. Enter your email address to follow our progress and receive notifications of new posts by email.